TAINTED NATION is a powerful quartet from the UK, was assembled firstly by Pete Newdeck, drummer of Eden's Curse. Pete Newdeck had been busily writing and demoing material with friend and also Lionsheart Guitarist Ian Nash, putting together an album of powerful commercial yet modern heavy material plus the twist being that this time Newdeck had sung. TAINTED NATION announced the line up late 2012, and released their debut album "F.E.A.R." through Massacre Records in January 2013. The album was recorded in Athens (Greece), Stockholm (Sweden) and Tewkesbury (England), produced by Pete Newdeck and mixed by none other than Dennis Ward. Press say the band is alike the identity to Sixx A.M., Shinedown, Bullet For My Valentine along with many past and classic influences, with a strong commercial vane running right through the middle. How is your impression of their music? 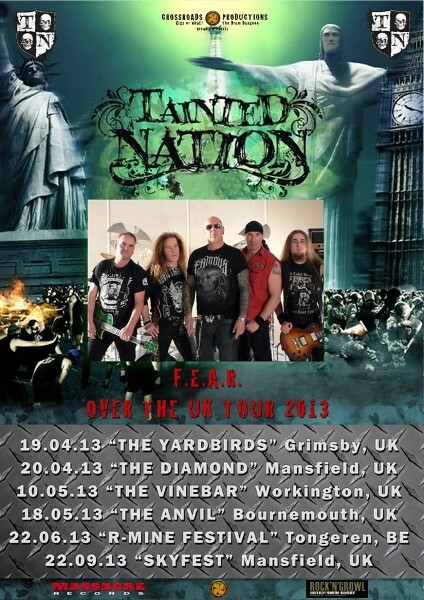 Now TAINTED NATION is on "Over The UK Tour 2013" started from April 19th and will perform at R-Mine Festival in June 2013.